Thumba starts off looking a bit different from other photo editors and keeps going from there. 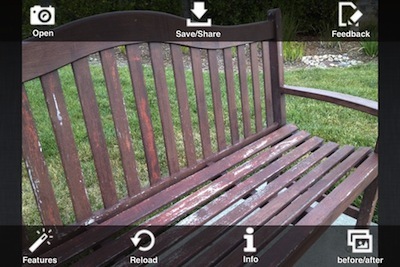 Take a photo or import it results in a full image view and simple buttons. Thumba Photo Editor lets you grab another image, save and share, filters/effects, more information and a view of the photo before/after changes. 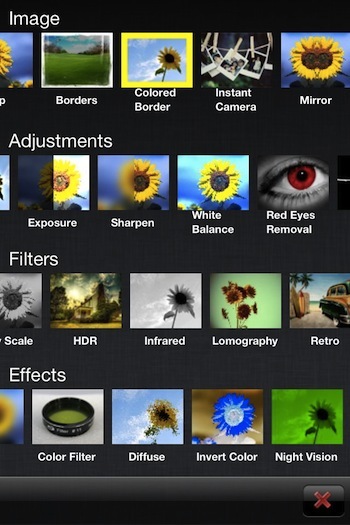 The tools are arranged differently than most photo editing tools on the iPhone. 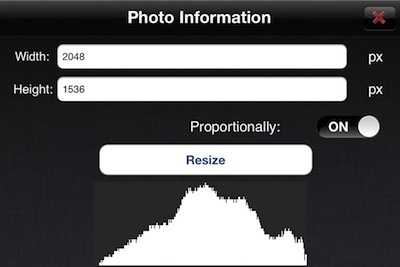 Thumba has rows to sweep through aligned in groups for: Image, Adjustments, Filters and Effects. Where most photo editing apps offer crop, borders and filters, Thumba has extended the options with more tuning in the more professional area. Pro like tools, yet still simple to use. 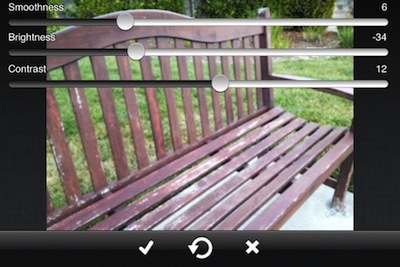 Depending on the tuning tool chosen, Thumba presents sliders for more customizable adjustments. More info can be found on the image through the Thumba’s ‘i’ button. I like the adjustable resizing of the overall image. This is handy when I’m going to use the photo in a blog post vs sending to friends.